Beautiful Baby Girl 1st Birthday Tutu Outfit. Custom made for each Princess. Can be customized to your 1st Birthday theme colors! Great Birthday Gift! Beautiful for photo prop! Available for all ages please message me for details. This listing is for a tutu,shirt and bow. 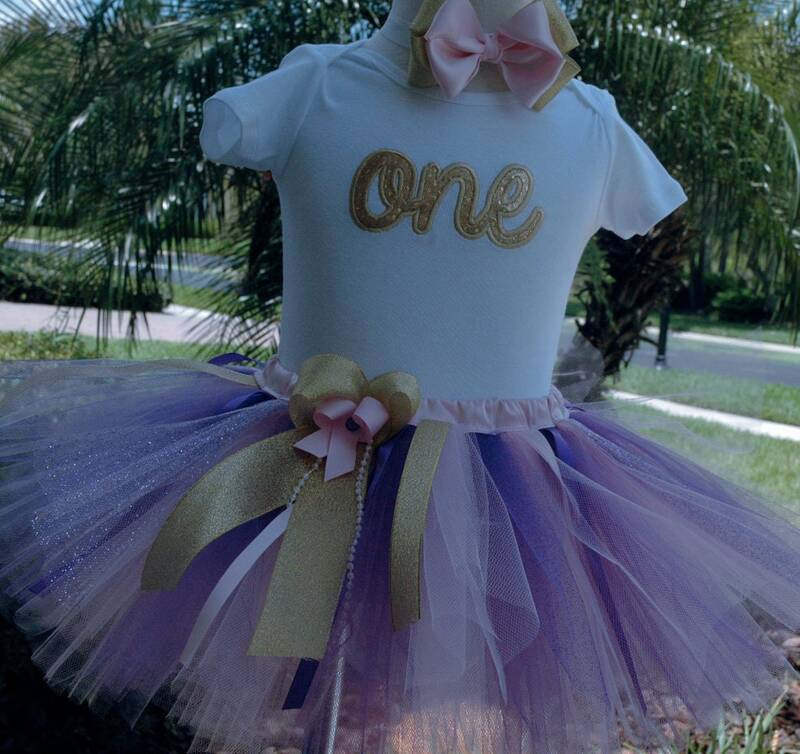 This beautiful gold,purple and pink tutu set has been handcrafted for perfection and your Princess will look beautiful!! Shirt will be personalized with the ONE in gold colors. I Both appliques are sewn to the shirt with beautiful matching thread colors. Tutu skirt has been created with soft high quality tulle. Hand cut tulle in many soft pink and purple colors including sparkly pink tulle. Beautiful pink and gold strands of ribbon surround the tutu. Gorgeous long bow in front of the tutu features soft pink pearls, small gold bow and beautiful soft pink satin bow. This beautiful tutu is very full and has been sewn not braided! The waist features a beautiful soft pink fabric. The beautiful boutique hair bow is made with one soft pink bow and a gold bow on the back of it. Features a small gold bow and a beautiful pink rhinestone on it. The bow has been hand sewn and does not contain any wires!! Finally the bows are sewn together and placed on a beautiful elastic white headband. Long sleeve and short sleeve available at checkout for free. Add the Birthday Hat!! Here's the link for it! !